Get off the ferry from Mackinaw City or St. Ignace to Mackinac Island and it is like stepping back in time. The first sounds are those of horses clip clopping down the street. Horse-drawn taxis await ferry passengers or just start walking. Mackinac Island has a downtown district like no other in Michigan and perhaps the Midwest or US. There are no cars, only bikes and horses. No cookie cutter stores. No enclosed mall shopping. Just unique shops, one after the other, lining Main Street and Market Street in a gorgeous and historic setting on Lake Huron in the Straits of Mackinac. Once a bustling fur trading center--nearly half a century long--downtown Mackinac Island is a National Historic Landmark, Historic Downtown accredited by American Association of Museums. 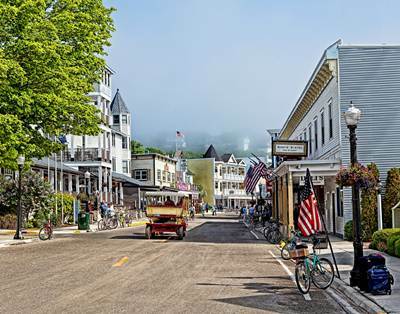 Shopping, dining, and lodging blend with five historic buildings including the Dr. Beaumont Museum/1820 American Fur Company Store, Biddle House, the Blacksmith Shop, McGulpin House, and Mission Church that were part of the early 19th century fur trade on Mackinac Island. What can you find on Mackinac Island? Spa items, clothing, jewelry, t-shirts, scrimshaw, books, art, glass, flowers, and garden supplies just to name a few. And, of course, fudge! Downtown Mackinac Island is also a place to rent a bike, hop on a carriage tour, hail a horse-drawn taxi, or just walk. Downtown Mackinac Island is a Northern Michigan gem filled with great places to eat from tiny bistros to fine dining. Grab a cup of coffee or pack a lunch from the grocery store. It's here and more. And don't worry about carrying your purchases around Mackinac Island or back across on the ferry: Mackinac Island shopkeepers will ship your purchases directly to your home. So start your day on Mackinac Island downtown and then head around the Island on a bike, or take a carriage tour, or catch a taxi to your hotel, or rent a horse for a leisurely ride on beautiful wooded trails. Mackinac Island. You bet!